After the founding of the 4th Dynasty by Snefru c. 2613 BC, more historical records and portraits of royalty have survived. Snefru married the previous king Huni's daughter, Hetepheres, who was to find great fame as the mother of Khufu (p. 49). Manetho says (according to Eusebius) that the dynasty consisted of 17 kings of Memphis who reigned for a total of 448 years (the Africanus version gives only 8 kings and 277 years). The kings of the 3rd Dynasty were also Memphite, but it is specifically said of the 4th Dynasty that, although of Memphis, they were of a different royal line. It would appear that Snefru's marriage to Fluni's daughter brought the two lines together, but it was a sufficient break in Manetho's eyes to constitute a new dynasty. He identifies the first king as Soris (= Snefru) who reigned for 29 years, although present opinion is more in favour of about 24 years. Snefru was a son of Huni, probably by a minor wife called Meresankh. By marrying Hetepheres, who presumably carried the royal blood as the daughter of a more senior queen, he consolidated his claim to the throne. Snefru was probably therefore Hetepheres' half-brother. 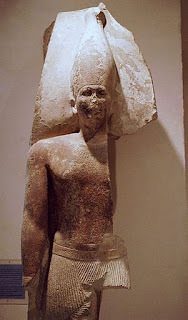 Huni is the last king of the 3rd Dynasty in both the Royal Canon of Turin and the later Saqqara List. There are records, principally from the Palermo Stone, of Snefru's expeditions beyond the boundaries of Egypt - to the Lebanon to fetch the great cedar logs needed for temple doors and great ships, and to Sinai for turquoise. Although there is evidence as early as the 1st Dynasty of expeditions to Sinai, Snefru seems to have become particularly associated with the area, and was worshipped there as a god according to a much later inscription left in the Wadi Maghara. Snefru also appears on two contemporary reliefs near each other in the Wadi, here given his full titles and noted as Smiter of Barbarians'; he is shown in the already age-old attitude of doing just this. Snefru moved the royal burial ground yet again, not back to Memphis as might perhaps be expected, but to a new site at Dahshur, 28 miles (45 km) north of Meydum. What governed the choice is not known, but he built two pyramids for himself there, and several kings of the later 12th Dynasty were to follow his choice of site.